Grapefruit doesn’t only contain vitamin C which is commonly known to be protective against cold or flu. It is not just one nutrient that helps prevent a certain disease, but rather the combination of all the nutrients in it that does the trick. This is the kind of synergistic nutritional power that we can find only in the way that Nature provides in our natural food. Grapefruit peel is rich in flavonone glycosides and polymethoxyflavones (PMFs). The citrus flavonoids have recently gained increased medical attention due to its protective effects against the occurrence of cancer. This juicy fruit also have citric acid, natural sugars, essential oils like limonene, pinene and citral. It has high amounts of vitamin C, and smaller amounts of vitamin A, B complex, E and K.
In the mineral department, larger amounts of calcium, folate, phosphorus, choline and potassium are found. The nutritive phytonutrients of this voluptuous fruit—liminoids, flavonoids, lycopene and glucarates—help fight cancer and various diseases. 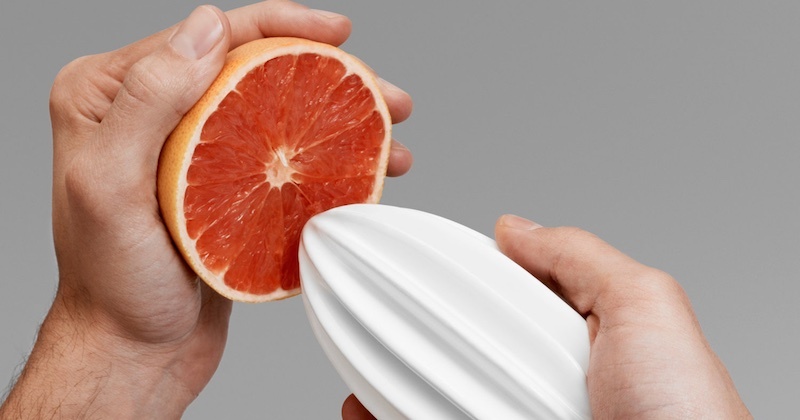 In a study using a specific variety of grapefruit, the “Rio Red”, common household processing practices were analyzed for their phytonutrient content. Grapefruits were processed by blending, juicing and hand squeezing. Grapefruit juice processed by blending had significantly higher levels of flavonoids (narirutin, naringin, hesperidin, neohesperidin, didymin and poncirin) and limonin, compared to juicing and hand squeezing! Blending grapefruit juice also produced significantly higher levels of bergamottin. Bergamottin is an antimutagenic compound that inhibits the mutation of cells. It also inhibits CYP1A1—an enzyme that can activate some toxic compounds into cancer-causing agents. Ascorbic acid (a.k.a. vitamin C) and citric acid were significantly higher in juice processed by juicing and blending, respectively. Hand-squeezed grapefruit juice had significantly higher contents of dihydroxybergamottin (DHB) than juice processed by juicing and blending. DHB is a compound found in grapefruit juice that although interferes with the metabolism of pharmaceutical drugs, but in actuality prevents oxidation of drugs, increasing oral bioavailability of natural nutrients present in the body. So there you have it. Looks like blending grapefruit is a great decision if you are using grapefruit to fight cancer. To boost your immune system or to recover from a cold, juice. If generally consuming grapefruit for all its rich benefits, any way of extracting the juice is better than not consuming! When eating or juicing grapefruit, peel off the skin but leave some of the albedo intact as it contains the highest amount of valuable bioflavonoids and other anti-cancer agents. Bioflavonoids will superboost the nutrients contained in grapefruit. Grapefruits have a few important phytonutrients that are powerful antioxidants. Many of the little known phytonutrients are mentioned above in their nutritional benefits. The more commonly known antioxidants are vitamin C, beta-carotene, lycopene and flavonones. On top of these, there are also anti-inflammatory properties, making grapefruit beneficial for fighting many ailments, even cancer. Most of the anticancer agents found in grapefruit are in the albedo (just under the skin), so be sure to include some of the peel when juicing or blending. They were found to be particularly protective against cancers of the stomach and pancreas. It follows that when a fruit or a vegetable has very high content of antioxidants (and most of them do), they always make an excellent food that can help improve blood circulation. Individuals with poor blood circulation for extended periods of time will find that their immune system is low. With poor blood flow, it sets the stage for any chronic disease to happen. Drinking grapefruit juice regularly helps to improve blood circulation and along with that, reverses many health issues and conditions. Although grapefruit has a sub-acid taste, it is really an alkaline-forming food. This has a profound effect in the treatment of acidity in the digestive system. An acidic environment sets the perfect environment for sickness and diseases to take a foothold. This includes overgrowth of yeasts, bacteria, viruses and parasites that can cause a whole set of other health problems. Pectin in this fruit has been found to be effective in reducing the accumulation of arterial deposits, and the vitamin C helps to strengthen and maintain the elasticity of arteries, preventing atherosclerosis. If you are not on any hypertension medication, grapefruit makes an excellent food for lowering high blood pressure. Thanks to the high content of potassium, lycopene, choline and vitamin C, grapefruit juice can regulate and normalize blood pressure. Eating higher amounts of flavonoids-rich food such as grapefruit, may also lower the risk of ischemic stroke in both men and women. There are good reasons why grapefruit is often used in liver and gallbladder cleanse protocols. First of all, the bitter in grapefruit makes it an excellent liver support food. Naringenin is the bitter flavonoid in grapefruit, and it has shown beneficial effects on nonalcoholic fatty liver disease (NAFLD). Studies are finding more and more benefits in using this compound for treatments of different liver diseases. When you overwork, your body goes through a period of stress. Your immune system often takes a toll and you are more likely to catch a bug. A common cold is your body signalling you that your immune system is low. Drink a glass of grapefruit juice regularly for its high vitamin C content, and give your immune system the extra boost to prevent any sickness coming on full-blown. A grapefruit a day can keep heart disease at bay. According to a study that was published in the American Journal of Clinical Nutrition, drinking a glass of grapefruit juice every day keeps your blood vessels healthy and lowers your risk of heart disease. This study identified flavonones as health-boosting agents commonly found in citrus fruits. Researchers from the Hebrew University in Jerusalem tested grapefruits for their cholesterol-lowering abilities. Participants were patients who recently had coronary bypass surgery with high blood cholesterol and had failed to respond positively to statin drugs. The patients were divided into three groups, given servings of fresh red grapefruits, white grapefruits and no grapefruit, along with regular, balanced meals for 30 days. It was observed that the fresh red grapefruit positively influenced serum lipid levels, especially serum triglycerides and serum antioxidant activity. The white grapefruit also showed promising cholesterol-lowering ability although a little less than the red grapefruit. There was no change in lipid levels in patients who did not eat grapefruit. It is interesting to note that pink to red grapefruits contain lycopene, a carotenoid that gives the fruits their colors. Eating diets rich in carotenoids have been shown to lower risks of heart disease and other diseases. There is evidence to show that grapefruit may reduce blood pressure. In a study on blood pressure in healthy, overweight adults, participants were given one half of a fresh Rio Red grapefruit with each meal (3 times daily) for six weeks. Grapefruit consumption was associated with significant reduction in systolic blood pressure. Improvements were observed in circulating lipids, with total cholesterol and “bad” LDL (low-density lipoprotein) significantly decreased. 91 obese patients participated in a study on the effects of grapefruit on weight and insulin resistance. They were randomized into four groups with different combinations of apple juice, grapefruit juice, fresh grapefruit, grapefruit capsules and placebo capsules. Metabolic syndrome parameters were measured at the beginning and end of the 12-week study. After 12 weeks, it was observed that the fresh grapefruit group had lost 1.6 kg. The grapefruit juice group had lost 1.5 kg. The grapefruit capsule group had lost 1.1 kg and the placebo group’s weight loss was insignificant. There was also a significant reduction in 2-hour post-glucose insulin level in the grapefruit group, compared with the placebo group. In metabolic syndrome patients, the effect was also seen with the grapefruit capsules. Insulin resistance was improved with fresh grapefruit. Studies show that there is a link between lack of lycopene in your diet with two sleep problems. “Short sleep”—meaning sleeping five or less hours in the night, and difficulty falling asleep. People with these two sleep problems generally have lower levels of lycopene in their blood than those who get quality sleep. Pink or red grapefruits contain high levels of lycopene that promote better sleep pattern. Eating a grapefruit before bedtime will help your body get that rest it needs. Grapefruit contains many other medicinal properties that make it an excellent food for individuals suffering from digestive disorders such as indigestion, constipation, IBS, gas, bloating and the like. Eating a grapefruit helps stimulate production of healthy stomach acid for proper digestion of food. Its high antioxidative and anti-inflammatory effects help to reduce digestive discomfort from a poor diet. When eating the fruit, eat it with its albedo and pith (the white matters under the skin) for their extra fiber that aids bowel movements. Taking high doses of vitamin C is a great help to boost your immune system in fighting a cough, cold and sore throat that usually come in a cluster. Although oranges are high in vitamin C, it is not advisable to eat them when you have a sore throat due to its “warming” nature. Instead, drink freshly-extracted grapefruit juice with a little raw honey that helps to relieve sore throats and soothes coughs almost instantly. Choose grapefruits as you would oranges—firm and springy to the touch. If you can, choose the pink or red variety which contain more phytonutrients, and are slightly sweeter. Keep grapefruits at room temperature before juicing to get maximum juice yield. To prepare, quarter the fruit and peel off the skin. When is the best time to drink grapefruit juice? 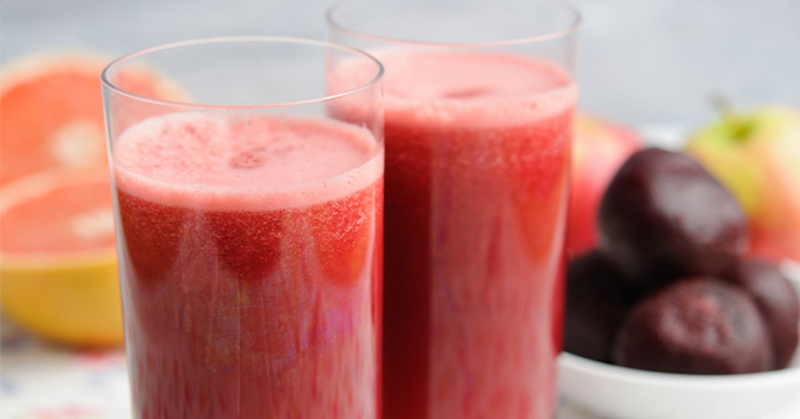 I always suggest drinking freshly-extracted juices at least 15 minutes before a meal. 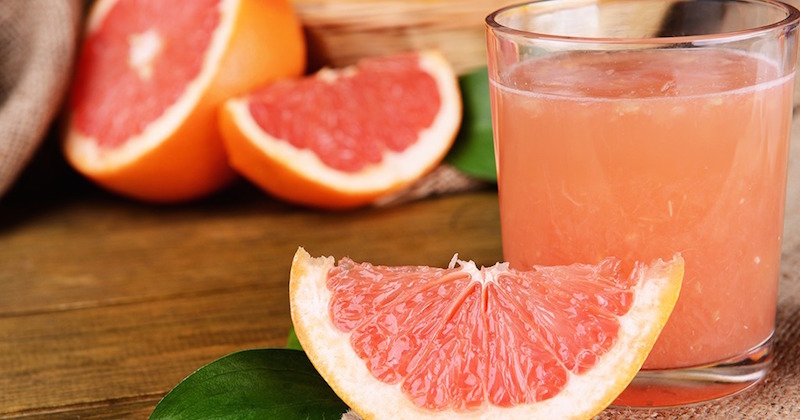 Grapefruit juice helps to improve the digestive health, and your body also gets the most nutrients out of the fruit when eaten/drunk on an empty stomach. Instead of juicing, grapefruit may also be eaten whole or blended, for added fiber. There are many benefits to drinking grapefruit juice whether in the morning or in the evening. For weight loss efforts, you may use half a grapefruit 3x/day 15 minutes before your meal. The presence of grapefruits may halt the metabolism of these drugs, leaving the drugs in your body, thus creating the risk of toxic poisoning. You may have been told that grapefruit is the cause of the toxicity, but in fact, it is really the drugs that is causing the toxicity.